The methods section of an experimental paper explains, “Participants read assertions whose veracity was either affirmed or denied by the subsequent presentation of an assessment word.” After some detective work, I determined that it meant, “Participants read sentences, each followed by the word true or false.” The original academese was not as concise, accurate, or scientific as the plain English translation. To be fair, I know scientists who write with an enviable clarity. My PhD advisor, Saeed Tavazoie, is one of those academics. The ease with which he finds the right adjectives and adverbs, even in the context of a casual conversation about his scientific ideas, has always baffled me. More importantly, I believe that the ability to deconstruct a complex notion into parts that can be simply conveyed is a measure of true understanding of scientific matter. Unfortunately, I’m not one of those scientists… at least not yet. 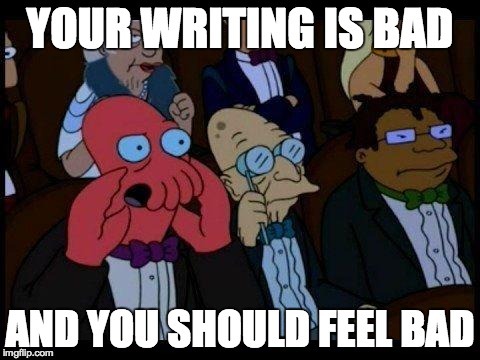 Your writing is bad, and you should feel bad… Dr. Zoidberg is judging you! My argument is that writing a paper for a broad audience may create a false sense of comprehension. For example, if someone doesn’t know what Arabidopsis is, they should not be reading the text in the first place. Words like significant, informative, association, sufficient, causal and … have specific scientific and mathematical meanings that are distinctly different from their everyday use. Not knowing the scientific context in which these words are used, will clearly change our understanding of the text. While academics should absolutely engage in popular science writing, I don’t think scientific papers are the right medium for this endeavor. We as scientists may even want to use the language of the abstract to set a bar for who should be reading the paper in the first place. Public media is rife with examples were non-experts feel they have understood the subject matter in cases where they clearly have not. How many times have we discussed the misuse of “correlation” versus “causation” by the media originating from poor understanding of a published paper. Again, I’m not talking about convoluted writing here, but rather technical writing. For example, as part of the qualification exams for my PhD candidacy, I was assigned a paper from Bernhard Palsson’s group. The abstract has phrases like “constraints-based in silico models have been used to calculate optimal growth rates” or “incorrect predictions of in silico models based on optimal performance criteria”. I was completely baffled by the text and I couldn’t even begin to understand the problem the authors were trying to address (you can try this yourself by reading the abstract). It was after reading many MANY papers from this field that I began to understand the language and with that the science behind it. In other words, comprehending the language is serving as a gauge for the ability to understand the science behind it with minimal risk of unintended misunderstandings. As JRR Tolkien wrote, at the Doors of Durin, you should be able to speak friend to enter… scientific papers, akin to mines of moria, are dangerous territories. Two papers showed up in the last issue of Nature methods that caught my attention: I mean Levsesque et al of U Penn and Ke et al. from Stockholm University. I’m generally biased towards methods papers and I find them WAY more interesting than your run-of-the-mill biology papers. But why these two papers? I have a conviction… I say conviction because until now there was very little to back it up: the future of biology rests not just in our understanding the populations of cells and observing the “average” phenotypes/phenotypes, but rather a single-cell approach is required to understand all the complex dynamics upon which biological systems thrive. FIrst came single-cell sequencing… then came single-cell barcoded RNA-seq… and now single-cell in situ genotyping/sequencing is here. There is a magic to watching cells shine under a microscope… there is a feeling of vindication… of assurance. But it is not just that. A cell is already an “average”; an average of paternal and maternal genetic information. And FISH-based methods enable us to distinguish between them. More importantly, in addition to quantity (which to be fair is not its strongest suit), we get a feel for localization in different compartments. Granted I’ve never done a FISH experiment. So I really don’t know how much of this is real and how much of it cherry-picking. But I’m sure if we can get there, it will be illuminating. And I don’t mean that we should drop the population for single-cells… I think we’ll be in for a surprise. I think we’ll understand, at last, how stupid a single cell is. We’ll know that individual cells make a lot of mistakes and it is the averaging effect of a population that results in a coherent behavior. In other words, I’m not interested in studying single-cells per se, but rather I want to know about them so that I can have smarter models of a population. The same way a thought forms in our brains despite many erratic firings of individual neurons, I want to know how stable phenotypes emerge in spite of, not because of, single-cell variations. Only then we’ll know which pathways are consistently crucial for a single cell and which ones are meaningful only in the context of a population. As it’s probably obvious to the two people who follow my blog, I’ve been on a sort of hiatus. I’be been nursing a torn TFCC with significant debilitating effects on my ability to work/write. Which reminds me… watch out for that pesky lid on your liquid N2 storage units (you think they’ll stay up, but sometimes they won’t). But as my range of motion and quality of life increases, I’m planning my way back to writing about things that I find interesting in the forefronts of science. CISPRs: I wrote about the CRISPR/CAS system a while back and now they’re everywhere… with a vengeance! Multiplexed genome targeting of various genomes (including stem cells), guide-RNA mediated gene silencing, and other exciting tools. There are even companies starting to sell these products as evident in my targeted ads on various journal home-pages. I’m sure this is just the beginning… a lot more is coming. RNA elements: At last the first compendium of sequences bound by various RNA-binding protein was published. It’s in-vitro and limited but still… it’s a huge deal! I’m even more excited because my dear friend Hamed was the fifth co-first author on that paper (yes… there is such thing as 5th co-first author). Cancer research: there is no shortage of papers (great or otherwise) published on the subject of cancer/cancer metastasis. But it’s not every day that our lab is involved in major steps forward. Well… it may be every day but people have to actually wait until they come out. And many other things: I had flagged many papers to write about but to be honest a lot of them have lost their “it” factor at this point. I’ll write about some of them in an up-coming post very soon. A while back, with some not too complex detective work on the part of USA Today, we got our hands on the reviewer comments from the infamous #arseniclife paper. Looking at the reviews, I agreed with the experts, including Leonid Kruglyak, who “reviewed the reviews”, that they generally looked normal… yes, they were quite positive at times but let’s face it, some scientists are nice and some aren’t and by chance alone, you might have a group of three that use encouraging words even if there are criticisms. But since then, I’ve seen opinions written out there that are not too kind to these reviewers… good thing they’re anonymous, or we were looking for our pitchforks now! Even Ash Jogalekar over at “The Curious Wavefunction“, whose posts I often find refreshing, called the reviewers out on their subpar job. But what do “I” think about this whole fiasco? I think hindsight is 20/20… It all comes down to taking the authors at their word that there was no phosphorus in the media they used… everything else follows… But as it turns out, that is very difficult to achieve. But I didn’t know that and if I was a reviewer, I wouldn’t have brought it up either. I probably would’ve asked for specific experiments but they would be based on my background (and could be claimed to be “outside the scope”). And that is all it comes down to, isn’t it? Our backgrounds… and the reviewers are in fact chosen from different areas. For a paper like this, you probably will get a bacteriologist, may be someone working on Archea and maybe a chemist would not even be on the short list (let alone one that would have the relevant knowledge). In the end of the day, I don’t think that as researchers, we want reviewers to be too ambitious… we have all got bad reviews that we think are nonsensical. I actually think the reviewers should just make sure, given the facts and their knowledge, the results are not seriously flawed. And we all know that a published paper is not exactly the word of God and it can be easily refuted/corrected/expanded upon. This is Science we are talking about here… we like to think that the impact factor of the journal has a strong correlation to the strength of its underlying science. We all toil away for years hoping to get a paper in Science and it breaks our heart to see a flawed paper like this appear on its pages. I agree that this paper, in retrospect, is outrageous but this is not the first time a bad paper is published in Science or Nature or any other journal. This process shows every thing that’s wrong in research nowadays… holding press conferences like a true salesman, relying on seemingly random reviews to accept a paper and the disproportionate value associated to papers in big name journals. I am sure there are many world-class scientists who focus on GM-food safety. But I don’t know any of them, do I? Instead, I and many like me (who read science news) know Seralini, mainly because his papers are always controversial and go against the consensus of the field. There is nothing inherently wrong with that… but I think amazing claims require amazing accompanying evidence. It is OK when papers show up that go against the norm… either the whole field is wrong (which sometimes happens) or there is something wrong with that study (which happens quite often, case in point: faster than light neutrinos). But what I think is weird, is that these studies get WAY more publicity than they should. And in the end of the day, it makes us scientists look bad. People hear about all these extraordinary findings that are then debunked in a couple of months… no wonder we have problems with the perception of science in public. From linking disease to vaccination to discovering a new Arsenic-based form of life, we have let science down again and again… not by making mistakes. Being wrong is fine, it is the first step towards getting it right, but rather through pushing our results into the spotlight. Holding press conferences, enforcing gag orders on collaborators and pulling off all the PR stops. I assume, soon we’ll see trailers of upcoming publications on TV (“…starring POLR2A as RNA polymerase II”) with entertaining twists of course. The majority of science is still working the way it should, but that is not the part we read about in science news sections. I want to think scientists are better than this PR stuff… We were supposed to be skeptics, we were supposed to be above this… we were supposed to be living in our ivory towers. We shouldn’t care about the results of our experiments (positive or negative), we are supposed to be searching for truth… or so I thought.